Halfbrick hat seinen Jump & Run-Spiel Monster Dash, welches vor ca. zwei Monaten im AppStore erschienen ist, ein umfangreiches Update verpasst. 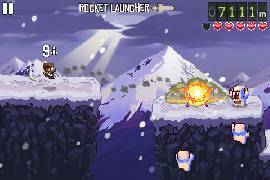 Dieses fügt dem Spiel dem Spiel ein neues Level namens „Yeti Heights“, einen abscheulichen Schneemann als neues Monster und einen Raketenwerfer als neue Waffe hinzu. Außerdem fügt es dem Spiel das neue Spielenetzwerk Game Center von Apple hinzu, mit welchem ihr euren Highscore online mitteilen und Achievements freischalten könnt. NEW LEVEL, NEW MONSTER, NEW WEAPON AND GAME CENTER! Monster Dash fans – you are in for a treat! This is by far our BIGGEST update ever, and we’re showing our support by kicking the action into a higher gear! NEW LEVEL AND MONSTER – Yeti Heights, featuring massive abominable snowmen to blast! With falling snow and music taking cues from Jingle Bells, this is one cool addition. NEW WEAPON – Rocket Launcher! This bad boy will decimate monsters with a special lock-on feature, also dealing collateral damage to any nearby spikes or hazards. At speed you will be a major force to be reckoned with! All the action is now yours to enjoy in this free update. Keep spreading the word of Monster Dash and we can keep supporting the game with new content and updates, bringing Barry Steakfries even more love!